Do you remember how great summer holidays were as a kid? A seemingly endless expanse of time when the daily routine of school-homework-weekends was suspended in a glut of play. I don’t remember the specifics of summer holidays but I do remember the rhythms. Cricket, of course – on the radio, on the television – accompanied by backyard cricket . We used an old wicker basket in place of stumps and stray balls routinely smashed the back windows. I wasn’t actually much of a player myself, so was regularly sent on runs up the bad-tempered neighbours driveway to rescue lost balls. Summer barbecues, swimming in friends’ pools, camping by the beach, icy poles, late nights. This year is W’s first school holiday season and I’ve been enjoying the dip into nostalgia as well as the beginnings of new traditions. We’ve spent several afternoons down at the pool eating watermelon and ice cream (and then stopping off for beers on the way home – a treat for the parents). Salty fish n chips for dinner, movies on hot afternoons, wearing pyjamas all day, painting on the lounge room floor and riding bikes up and down the street. Playing with the neighbours and cousins and going to friends places for barbecues. Sometimes I think it’s sacrilege that the whole world doesn’t stop for summer. Because why not? It’s the best of times. It’s winding down now, though, and I’m trying to eke the most out of these long lazy days by making meals that are delicious but quick ‘n easy. Soba noodles have featured frequently, as have eggs on toast and tortillas and anything on the barbecue. But my favourite thing at the moment is sautéed vegetables (this Charred Broccoli has been on high rotation). 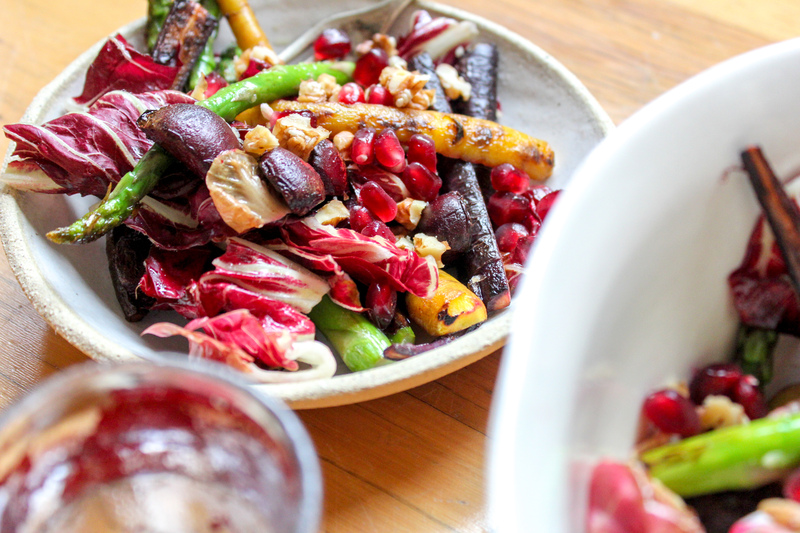 And so comes the Blistered Summer Salad – crunchy and bright and and charcoal-y and sweet/bitter all at once. And so lovely. 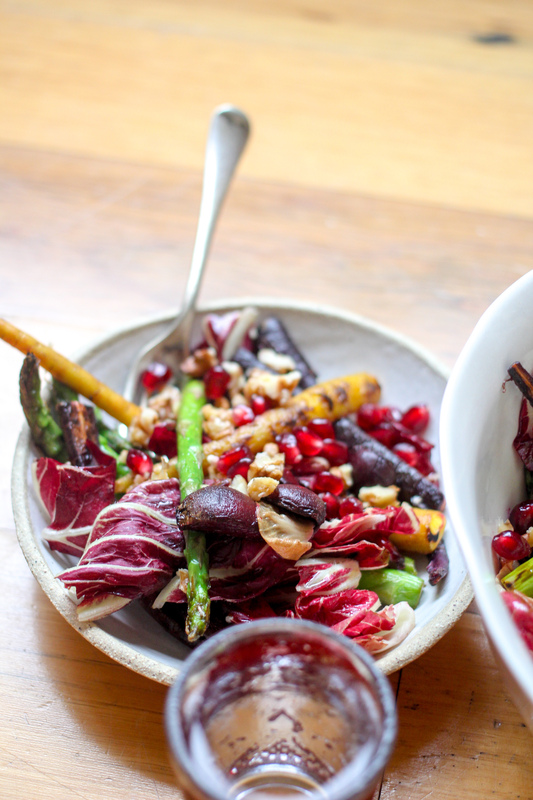 This recipe is forgiving – exchange the asparagus stalks for green beans or snow peas, use rocket instead of radicchio, roasted almonds instead of walnuts – you get the idea! The one key is to use fresh, seasonal ingredients. And if you’re not vegan, some shaved parmesan or manchego is a lovely addition. Prepare the dressing by whisking all of the ingredients together in a jar. Taste and add more salt if needed. Set aside. 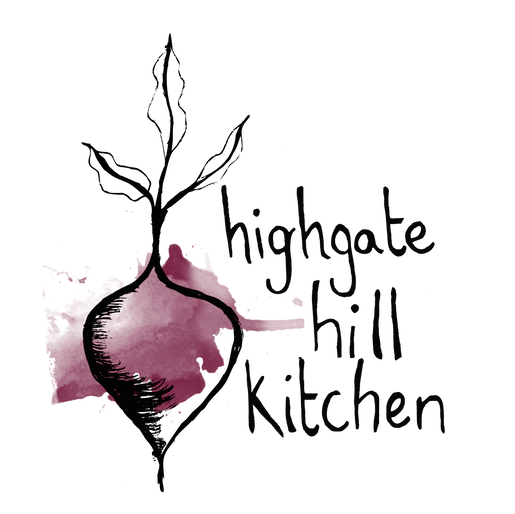 Prepare the radicchio by removing the core and any silted out leaves, then tearing the remaining leaves into large pieces – you can leave the smaller leaves whole. Peel the pomegranate and get rid of all the white pith, saving the seeds in a small bowl. 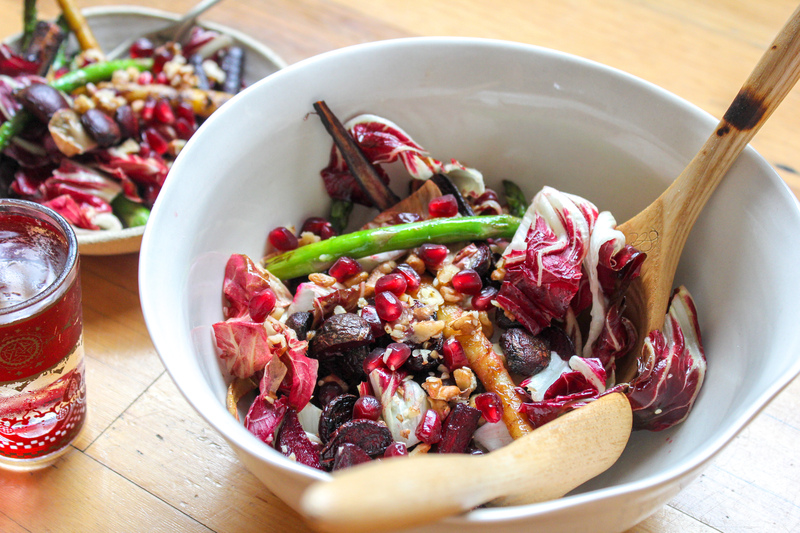 Roughly chop the walnuts and thrown them in with the pomegranate while you prepare the rest of the vegetables. Prepare your vegetables for sautéing. Remove the tough bottoms of the bottom of the asparagus stalks. Trim and halve (or quarter, if they’re large) the baby beetroots and carrots. 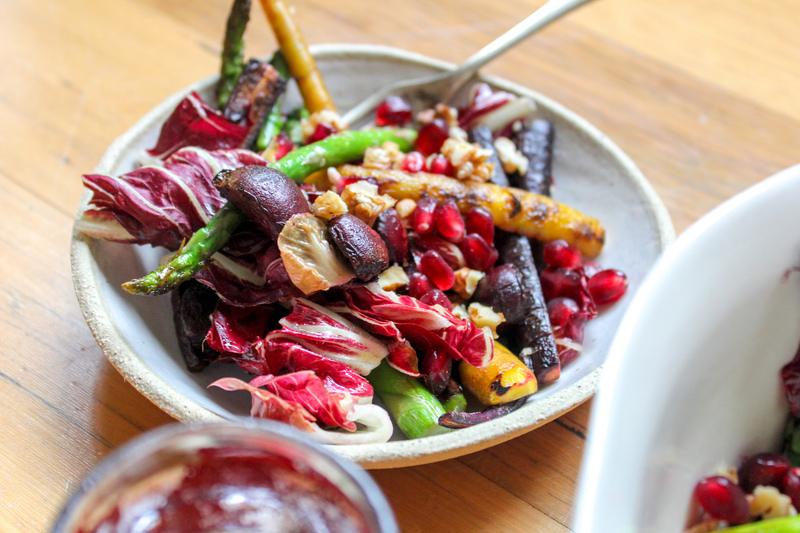 Add a generous glug of olive oil to a shallow pan over a high heat and throw the asparagus, the carrots and the baby beetroot in. Sauté the vegetables for up to 10 minutes, tossing every minute or so to cook evenly. When they’re ready, they should retain some crunch (especially the carrots) but be blistered along the edges. At this point, you can throw the radicchio in and cook for just another minute or two, which will soften the radicchio and take away its bitter edge (as well as its bright colour). 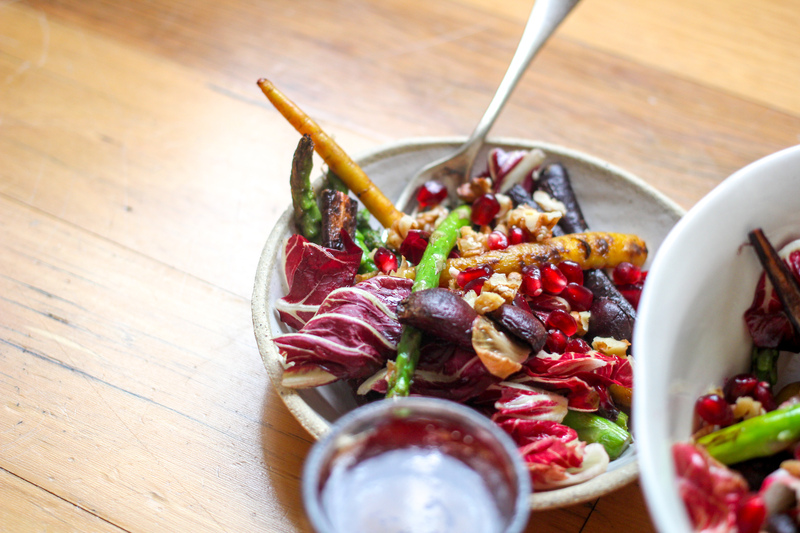 Personally, I like my radicchio raw, but it’s up to you! 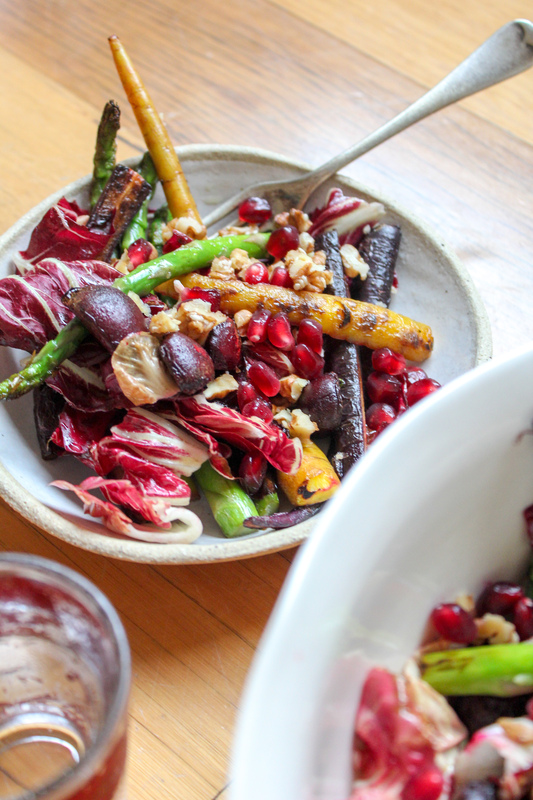 Throw all of the vegetables into a large bowl and toss half of the dressing through – give it a taste and add the rest if you think it needs it (otherwise the dressing will keep in the fridge for up to a week). 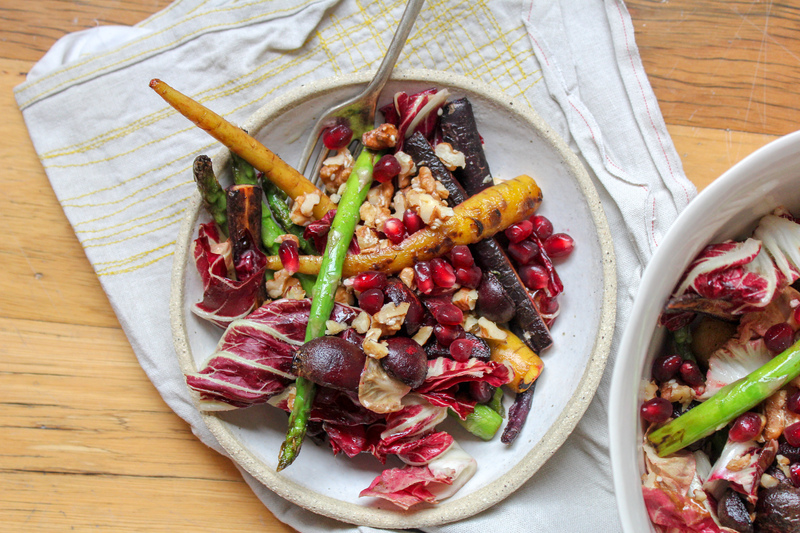 Sprinkle the pomegranate and walnuts over the top. Enjoy warm. 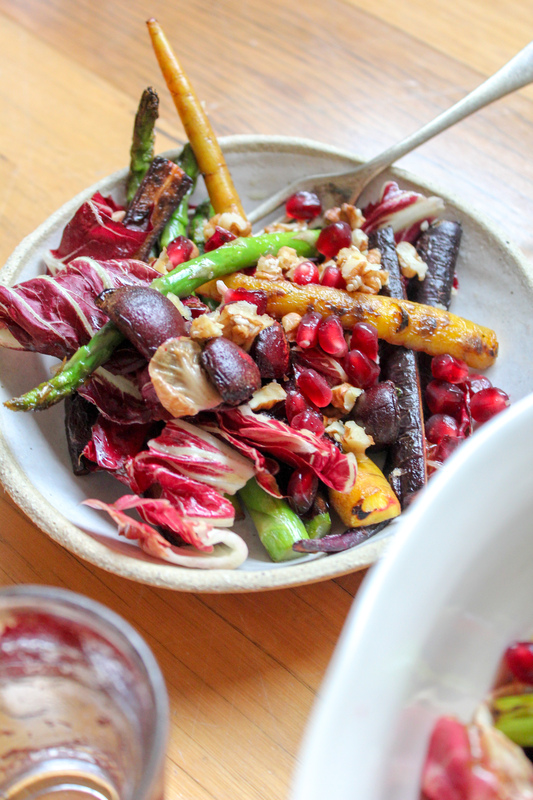 Beautiful salad – and that dressing!! Love that you added purple radicchio here especially. Thanks Katie 🙂 I’ve actually been making double batches of the dressing and keeping it in the fridge to put on all the things!